First I want to thank all the Grangers who helped out at the Big E this year. 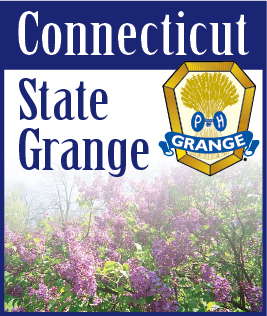 Whether you greeted visitors in the Connecticut room, worked in the Country Store or came on Grange Day and marched with us in the Big E parade, you all proved that the Grange is alive and active in New England and hopefully impressed some non-members enough to join. Thank you, Betty Jane Gardiner and Doris Shaw for rounding up all the volunteers that worked day in and day out in the New England Grange Building. These two ladies have been doing this longer than I can remember and when they are asked each year to do it again they reply, “I’d be delighted”. This brings us to the 124th State Session. One note of importance… We will be a little pressed for time this year. The Session will close at 3:00 PM. on Saturday the 18th and the installation of officers will be at 4:00 PM. That is right, the installation of officers. For those that may have forgotten this is an election year and I’m not referring to the U.S. president. That makes it more important that each Community Grange have delegates at the session to represent their Grange. The deliberations of this session will serve to guide the State Grange for the coming year. Pertinent information on the session is inside this issue. There was much information in the September issue and more in this issue regarding the National Session. I cannot urge you enough to take the necessary degrees so that you can take the Seventh and last Degree this year at the Bushnell Performing Arts Center in Hartford. The opportunity is there don’t waste it. The National Session is a great place to meet Grangers from the other thirty-six states and you will make lifelong friendships. Participate in as many activities as possible, especially those that support the youth and the juniors. One highlight of the session will be the Night of Excellence on Friday night. This will take place at the Welte Auditorium at Central Connecticut State University in New Britain. Please remember to register for the Convention. The application is included in this issue. A convention badge is required for admission to all events at National with the exception of the Seventh Degree at the Bushnell. The rest of this year is going to be very busy for us Grange folks and you can make it a very rewarding one. Sister Marge and I look forward to meeting you all at our State Session.